Annie Jr. Ticket Voucher Giveaway! 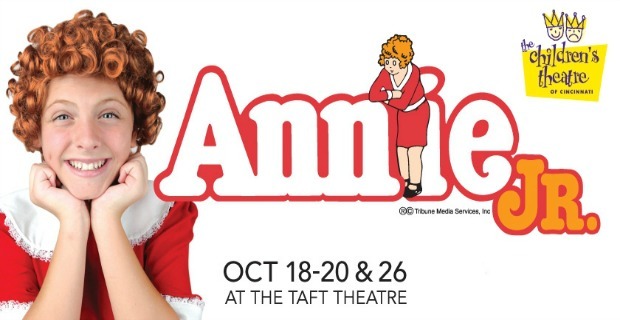 The sun will come out tomorrow… The Children’s Theatre of Cincinnati opens its 89th MainStage season with a production of “Annie JR.” at the Taft Theatre October 18-20 & 26, 2013. One of the world’s best-loved musicals features little orphan Annie who wins over everyone’s hearts. She is determined to find her parents, who abandoned her years ago on the doorstep of a New York City Orphanage run by the cruel, embittered Miss Hannigan. The ticket prices are $7-$25. Purchase tickets by calling 1-800-745-3000 or ordering from Ticketmaster. Visit The Children’s Theatre for more information. You can borrow the movie Annie from the Library. Visit our website to put it on hold! We are giving away a voucher good for four tickets to see Annie Jr on Friday, Oct. 18 at 7:30 p.m. Saturday, Oct. 19 at 2 p.m. or 5 p.m. We will draw one random winner on Friday, Oct. 11 at 12 p.m. The winner will be notified via Facebook and email. You have 24 hours to contact us via email or another name will be drawn. The winner will need to pick their voucher up at the Covington, Durr or Erlanger Branch. The voucher must be taken to the Taft Theatre box office one hour before show time to trade for tickets. Or you can call the theatre to reserve your seat in advance. Subject to availability. You have four ways to win! Be sure to comment separately for each entry. 2. Share this contest on Facebook and comment here that you did. 3. Like us on Facebook and comment here that you did. 4. Subscribe to the blog and comment here that you did. Kenton County Public Library employees and those living in their household are not permitted to participate.